UPDATE: This lounge is now closed. Please use another Star Alliance lounge in the terminal as directed by Singapore Airlines staff upon check-in. The Singapore Airlines SilverKris Lounge SFO (San Francisco) is located airside in the international departure terminal, Area G. As you clear security, make your first right towards the United Club and go down the long hallway. The SilverKris lounge will be on your left hand side about halfway down. The other airline lounges in this area include the United Club and the EVA Airways Lounge. Access to the Singapore Airlines SilverKris Lounge SFO is limited to passengers departing from Area G only. The Singapore Airlines SilverKris Lounge SFO is open to to premium cabin passengers traveling on Singapore Airlines, premium cabin passengers traveling on international Star Alliance operated flights, PPS/KrisFlyer Elite Gold members, and Star Alliance Gold members departing on international flights only. Note: United, Turkish Airlines and Aegean Star Alliance Gold members may not use the Singapore Airlines SilverKris Lounge SFO if your departure from SFO is a domestic flight, even if your next leg is an international flight. SilverKris Elite Gold members may use this lounge when traveling domestically or internationally on any Star Alliance partner flight. Example #1: United Gold traveling SFO to LAX to NRT – No access. Example #2: Singapore Elite Gold traveling SFO to LAX – Access. Example #3: United Gold traveling SFO to SIN on UA – Access. Example #4: United Gold traveling SFO to LAX – No access. The Singapore Airlines SilverKris Lounge SFO is open twice a day and the times vary depending on their departure schedule to Seoul and Hong Kong. Currently, the Singapore Airlines SilverKris Lounge SFO is open daily from 10:30 AM to 1:30 PM and 9:30 PM to 12:45 AM. During the winter months, the Singapore Airlines SilverKris Lounge SFO will be open from 9:30 AM to 12:30 PM and 8:35 PM to 11:45 PM. Unlike the other international SilverKris Lounges; there is no dedicated space for first class passengers here. The Singapore Airlines SilverKris Lounge SFO is not very large but it does offer a comfortable space to rest, relax and work before your flight. The lounge is one single room with the reception and self-service buffet station located in the center. There are seating areas located on either side of the buffet station with comfortable leather armchairs and low tables grouped together in small clusters. There are no recliners, day rooms or any other places to lie down. If you need to freshen up before your flight, there is one single shower room provided inside the lounge. There’s a small luggage storage area to the left of the reception desk if you want to store your belongings during your visit but it’s not secured. On the left side of the lounge, there is a long bar table with privacy partitions and PC computers for those needing to get some work in. The work space is pretty limited but there is enough room for a laptop and outlets to keep your devices powered. Password protected WiFi was provided throughout the lounge. There is a large wall of windows that let in a lot of natural lighting and provide views of the ramp and flight path. The self-service buffet station was pretty good. For lunchtime, there was a small selection of cold items such as cold cuts, cheese and crackers, pastries, salads and sushi and hot items such as Singaporean rice, chicken and a make your own Laksa soup station. The food was actually really tasty and filling if you’re on the hungrier side. The self-serve, alcohol station was good with a top shelf selection of spirits, wines and beers and a Nespresso machine with a variety of coffee options. Service-wise, there were only two employees working during our visit. There was one employee at the check-in counter and another employee doing everything else. The second employee literally was preparing the food, refilling the food station and cleaning up after the passengers. Because of that, service items did sit on the tables for quite some time and the food did take a long time to be prepared. I was actually really surprised by this as it wasn’t up to the usual Singapore Airlines standard. To be honest, I was actually quite disappointed with this lounge. It’s not as big or spectacular as their other international lounges and the lack of lounge attendants really surprised me. The space was very small (but never really got crowded during my visit). The amenities provided were fairly standard but to their credit, the alcohol selection was top shelf and the Singaporean buffet spread was delicious (even though it took a little long to be presented). 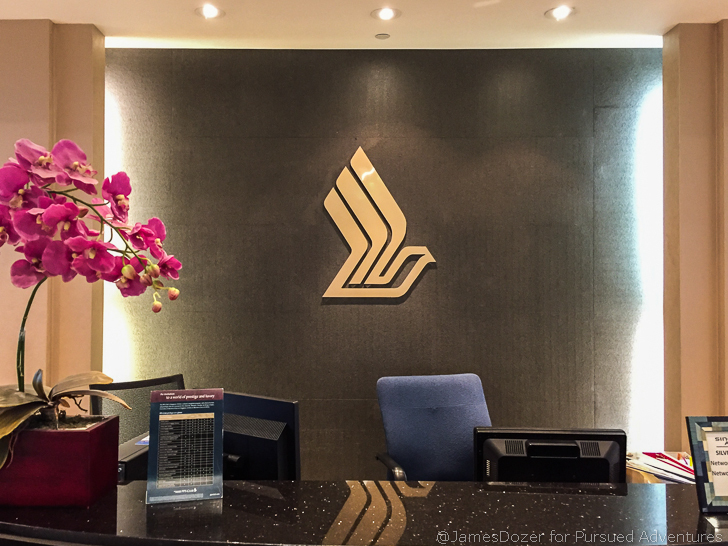 Overall, the Singapore Airlines SilverKris Lounge wasn’t a bad place to visit but it wasn’t up to Singapore Airlines standards, or at least what you would expect from Singapore Airlines. Literally, one additional employee would have made a world of difference. But despite its shortcomings, the lounge was quiet and comfortable and a much better place to wait for my flight than the United Club next door.